In the Nave of the museum. An exhibition by the CAPC musée d'art contemporain de Bordeaux, the Museo Nacional Centro de Arte Reina Sofia, Madrid and the KW Institute for Contemporary Art, Berlin. Exhibition organised as part of the Year France-Colombia 2017. 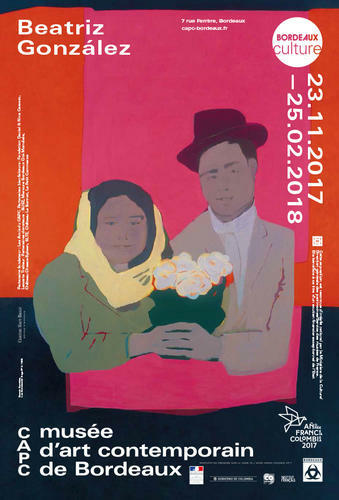 This exhibition is recognized as being of "Intérêt national" by the "ministère de la Culture/Direction générale des patrimoines/Service des musées de France". As such it benefits exceptionally from financial support from the French State. Beatriz González, whose work was recently seen in Athens and Kassel during Documenta 14, is an emblematic and fundamental artist from the Latin American art scene who has left a mark on generations of artists and thinkers. Her work pushes the boundaries of painting by expanding the media employed and bringing together history, politics, humour, the private, and the public. In 1964 she adopted a working process that has remained persistent in her work, involving the making of painting series that take images from the Colombian press as their starting point. Her archive of collected images shows to what extent her work is informed by popular imagery, constituting a fertile ground for research and art making from which folklore and the picturesque are extracted. Often using reporters' photographic work as a starting point, several works express the pain provoked by violence and death. Commenting on this aspect of González’s work, Boris Groys states that far from aiming towards neutrality through her appropriation of images from the press, "her painting remains personal and even intimate. She finds a way to turn the newspapers into her own personal, intimate diary – and also to make her own diary look political.” Beatriz González also shows an interest in the representation of popular culture icons, from sports stars to politicians or religious leaders, as well as representations of aboriginal cultures and Pre-Columbian art. Her pieces, presented as readymades, may take a range of different forms such as furniture or curtains. Forever active, the artist accompanies Colombia's strong social and political changes, and ironically describes herself as a "regional artist". Including paintings, drawings, etchings, sculptures, and installations, this first extensive international retrospective of Beatriz González, gathers some 130 works made between 1965 and 2017.